The latch hook kit took me a while to create, but it was a great distraction while I was waiting on the arrival of my twins! This is not necessarily a pattern, but I concept that you can apply to any size latch hook. First off, you want to match your gauge to the square of the latch hook, for me this ended up with a size H/5.0mm hook. For ease of sewing the border on, you want one single crochet stitch for every square. Across the top and bottom of my latch hook there are 101 square and on the sides there are 76 squares. You can easily adjust for the size of your latch hook. Want to match up with your latch hook – 1 sc for each square. With hook used to achieve guage and worsted weight yarn. Now you are going to be decreasing, so that the border wraps around the edge of the latch hook. Row 7: Ch 1, turn, 1 sc in each st across. (101) Fasten off, leaving a really long tail for sewing on. Row 7: Ch 1, turn, 1 sc in each st across. (75) Fasten off, leaving a really long tail for sewing on. Cut the edge of your latch hook, leaving a little over three rows of left over squares around all sides. Using a tapestry needle, start sewing at the corner, where the latch hook ends (see first picture below). Folding the border around the edge, sew through the front and back, to secure the border. 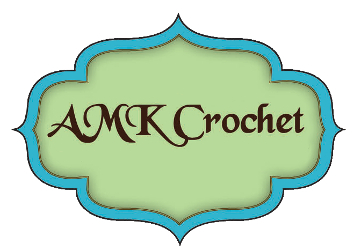 Sew one single crochet stitch for every square. One you have all sides sewn on, you can sew the ends together, at the corner. Bookmark this article Decorating with Yarn!